When it comest to your compost bin, you have many shapes, sizes and styles to choose from—here are a few of our favorites. Ah, compost, the environmentalist solution to food waste and every gardener’s dream! Collecting and managing the decomposition of kitchen scraps diverts them from the waste stream while creating a nutrient-rich material to add to your lawn or garden. Compost happens when organic matter breaks down into component parts over time by microbial and fungal digestion. This natural process can be encouraged by shading the composting material from sunlight, keeping it moist and adding digesters, like worms or inoculants. For all the vegetables that exist, there are as many compost bin designs to match. Some add whimsy and beauty to your homestead, while others are made from repurposed materials, and still others are specially designed to accelerate decomposition. Here are some of favorites. The most simple way to compost is in a heap. Layer “green” live-plant material with “brown” wood chips, leaves or paper in a pile. Turn regularly with a pitchfork, and eventually, you’ll have compost. There are many easy materials you can use to contain your heap: Straw bales, chicken wire rounds, wooden pallet sections or fence panels are just a few ideas to blend a compost system with your outdoor space. Small households might not have enough compost to justify a large system, or they may want to compost out of sight. For a simple small system, use a sturdy plastic bin or trash can drilled through with ample holes for air circulation and drainage. Remember to water regularly! The ideal compost routine will have an active “hot” pile and a cooler finishing pile. Some people want a third bay to stack materials before composting. Building a series of wooden and wire bins is a great way to cycle through your compost while allowing air and water to penetrate. For an upscale version, check out this innovative raised and covered multi-bin system from Samuel Kachmar Architects. An elevated rotating barrel is ideal for accelerating compost while keeping rodents and pests at bay. Many clever folks build a DIY stand and modify a 55-gallon plastic or steel barrel for this purpose, or create a rotating drum of wire. Serious gardeners looking to purchase a drum-style composter recommend the Compostumbler. Composting with worms, aka vermicomposting, is an effective and space-efficient way to reduce food waste. Colonies of worms require little maintenance, can be kept in the basement or garage, and their waste is a ready-to-use garden additive in as little as 12 weeks. 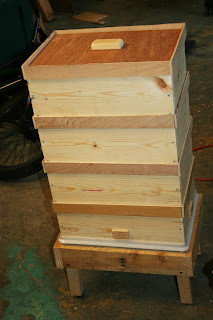 Stacking wooden bins is attractive and help sift the compost castings from the bedding material. Leave it to the people of a densely populated country to invent an extremely space-efficient composting system. Bokashi is an anaerobic (without air) fermentation method originating in Japan. Simply place food waste in a lidded bucket or bin, add in the bokashi mix (a microbe-inoculated wheat bran), and wait. In very little time, the waste will have decomposed into a slurry that can be added to the garden. Manufactured bokashi bins include a false bottom and spigot to drain the fermentation liquid. Tended correctly, bokashi is odorless and quick. There’s a compost system for everyone from apartment dweller to homeowner to farmer. Choose a design that fits your aesthetic, space and budget, and start reaping the rewards of turning trash to treasure!